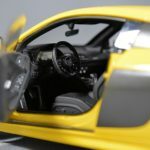 If you have been following us over the years, you know I have a passion for anything Audi, so when iScale released the dealer edition Audi R8 V10 Plus Coupe, you know I had to have one! The first batch came and went within a bat of an eyelash. 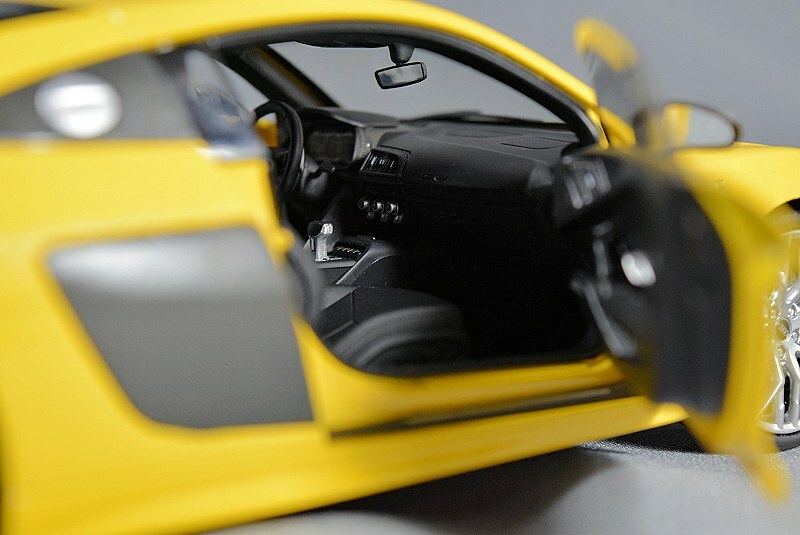 Months later I can present the second batch of the 1:18 Audi R8 V10 Plus Coupe in Vegas Yellow. Let me preface this review with some tidbits about the car. 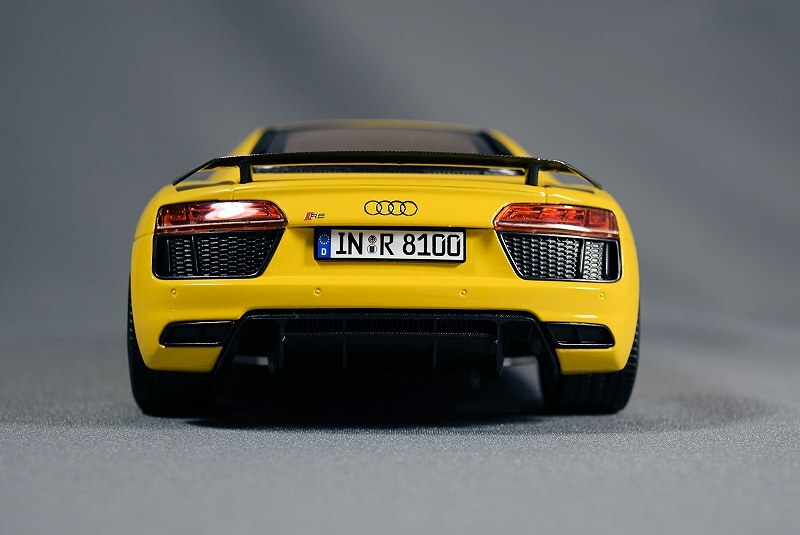 The second iteration of the R8 features a 540 horsepower V10. 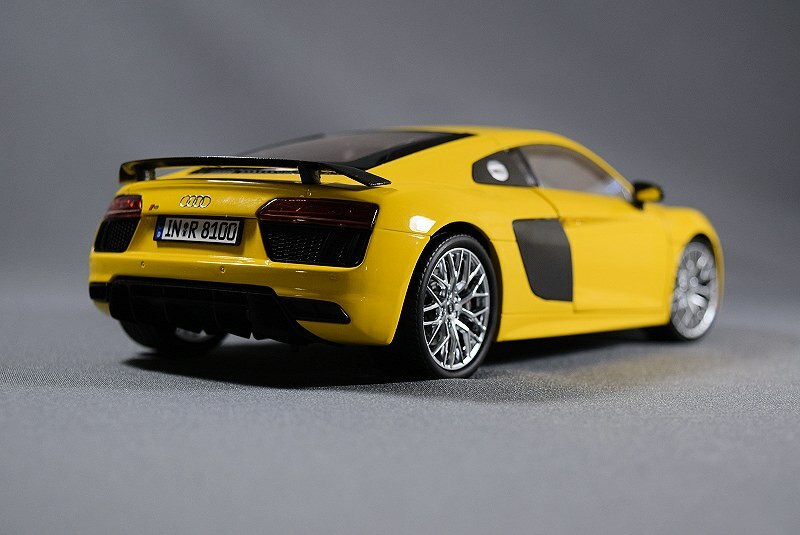 The V10 Plus makes 610, that’s 70 ponies more! The new exterior design and some of the best, if not the best, interiors in the business today, makes this an all-around winner in the supercar class. Let’s start with the exterior. The Vegas Yellow paint is the thing that instantly attracted me to the model; being labelled a dealer edition sealed the deal. 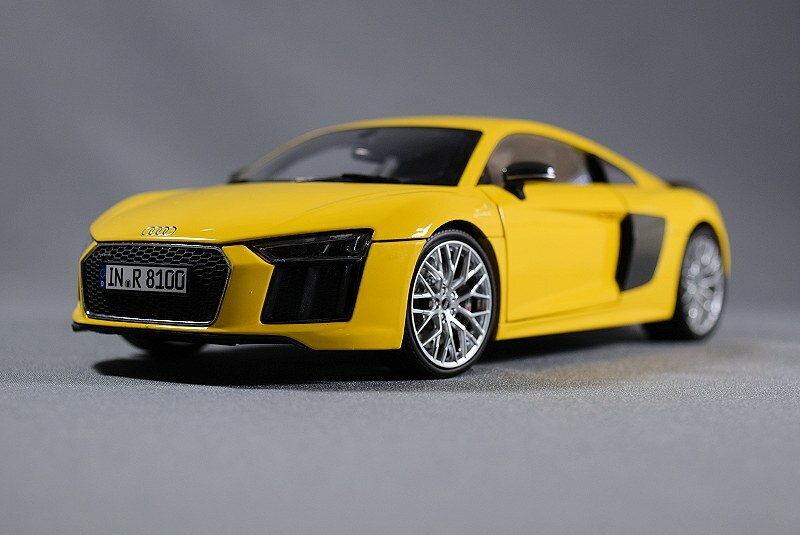 This is the 6th R8 in my collection to date, I have basically all the variants of the design from Coupe to rag-top. The execution of the paint is good, my model has no flaws to report. Overall lines are pretty good, but I think the front section is slightly off from the 1:1 – there is more of a pronounced swoop/curve. 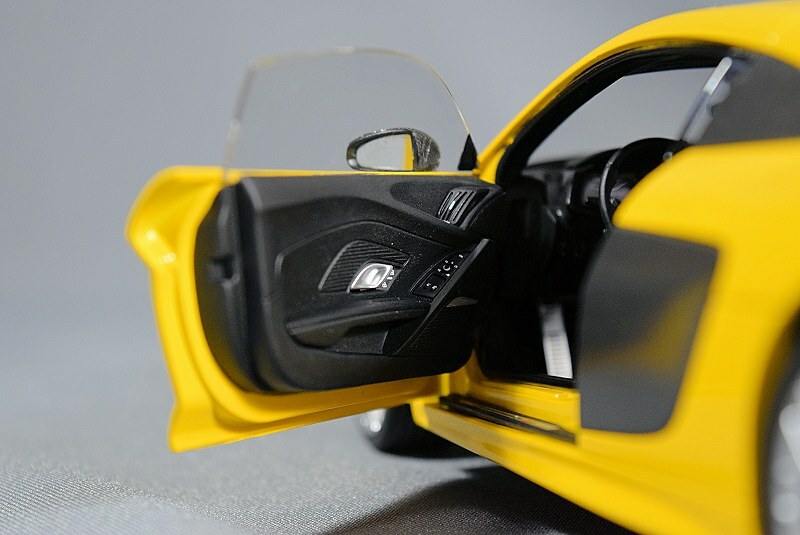 Shutlines and panel gaps are horrible on the model, especially where the door meets the front hood and hood resting in the closed position. Photos don’t lie! This was an issue with the first batch and it continues here. I know for a fact that Audi AG wasn’t impressed with the execution of the first release, so that may explain the quick departure of inventory. 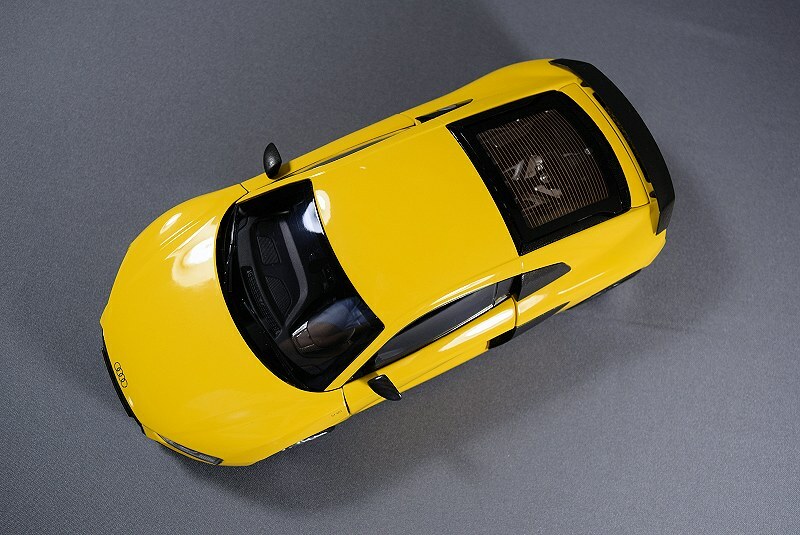 Exterior carbon fiber work is average at best and application in some areas is very poor. 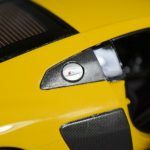 One thing I did appreciate was the side cooling ducts, they are actually capped with metal grilles (sorry I did not take a photo). 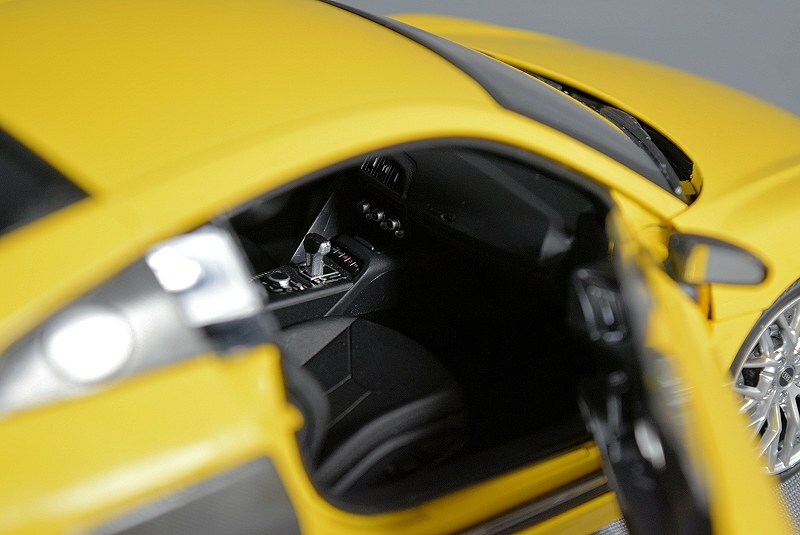 Lastly, the door handles are separate bits. The colour is off and the fitment is poor, but they do flow with the lines of the door. 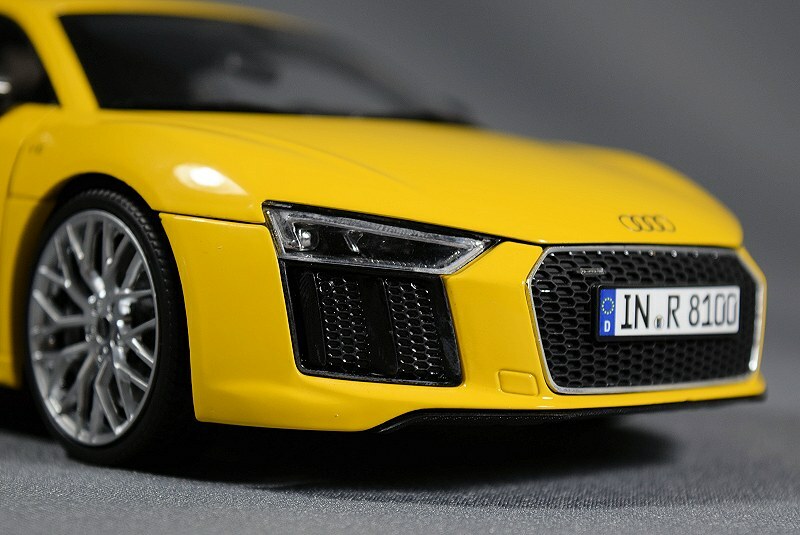 The front fascia does not include any perforated grilles; this includes centre, left and right. We have carved pieces of solid plastic here. Headlight detail is good. Storage area is fully carpeted and hood features struts left and right. Rear is much like the front. All grilles are solid pieces of plastic. The exhaust tips are unpainted and left in bare plastic finish. My passenger side taillight has some sort of residue or fingerprint-like artefact on it. Poor quality control for sure. 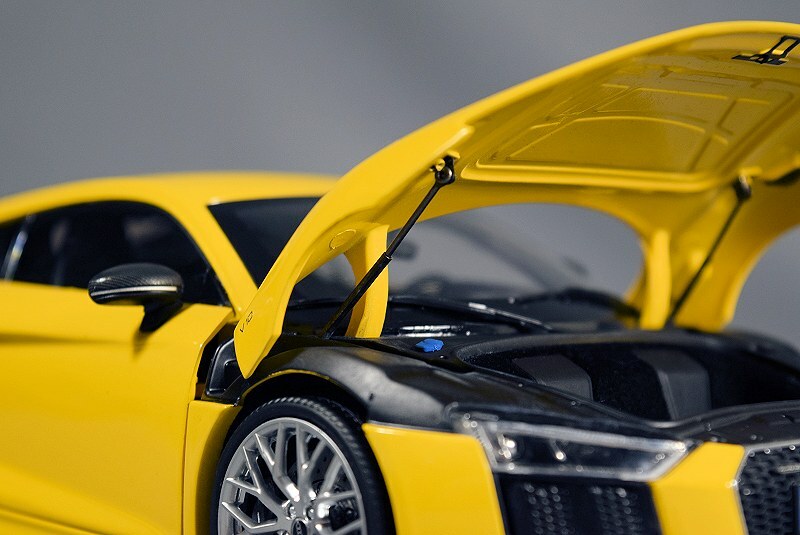 The heart of the R8 Plus is powered by a V10. 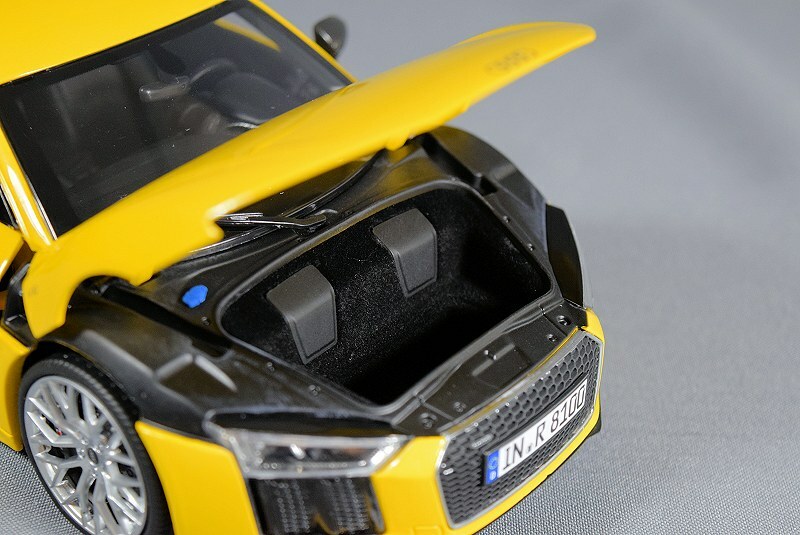 Motor execution is above average, in my opinion just little too plain and too plastic looking for a model sporting the Audi badge. 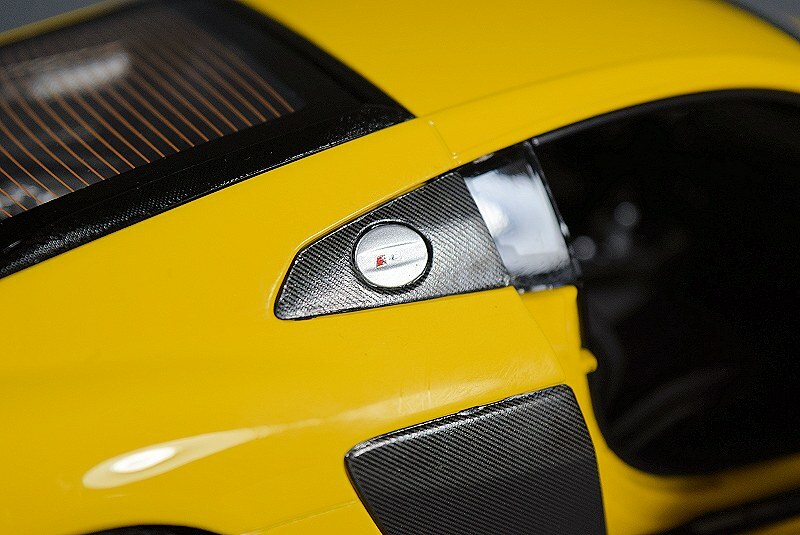 The carbon fibre work surrounding is average at best. And another nod to poor quality control, notice the broken hatch strut on the right. Thankfully this wasn’t too difficult to fix, a simple dap of CA glue and done. 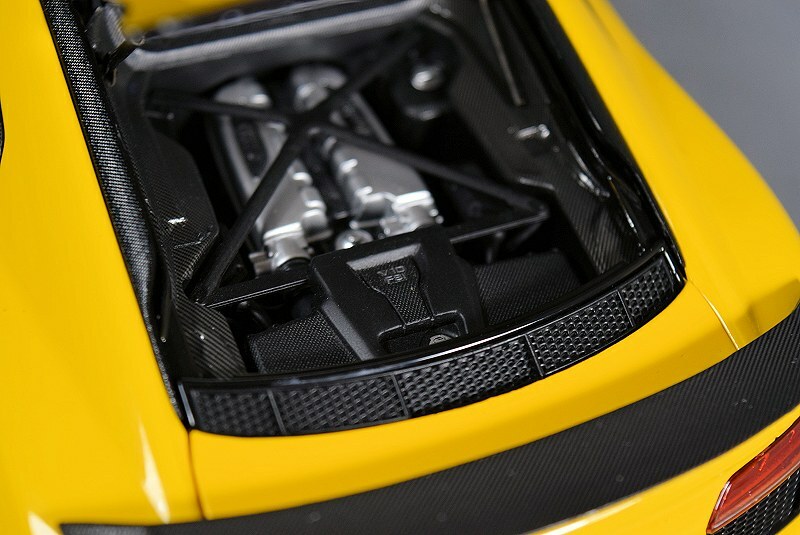 Also the lower surround cooling vents are solid pieces of plastic too. 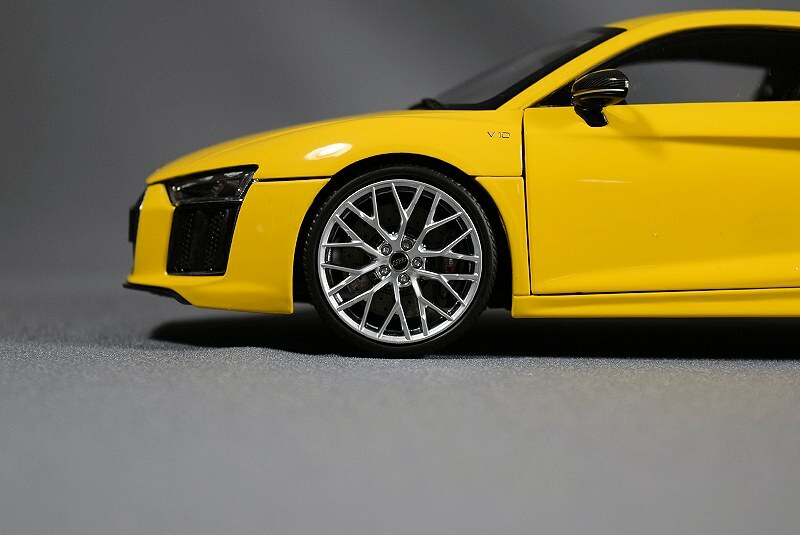 There has been a lot of debate on the wheel execution, here’s my two cents… First, the finish on the rims are good, maybe they could have used a better shade to mimic the original slightly better. I do think the overall diameter is slightly off on the front and worse on the rear. 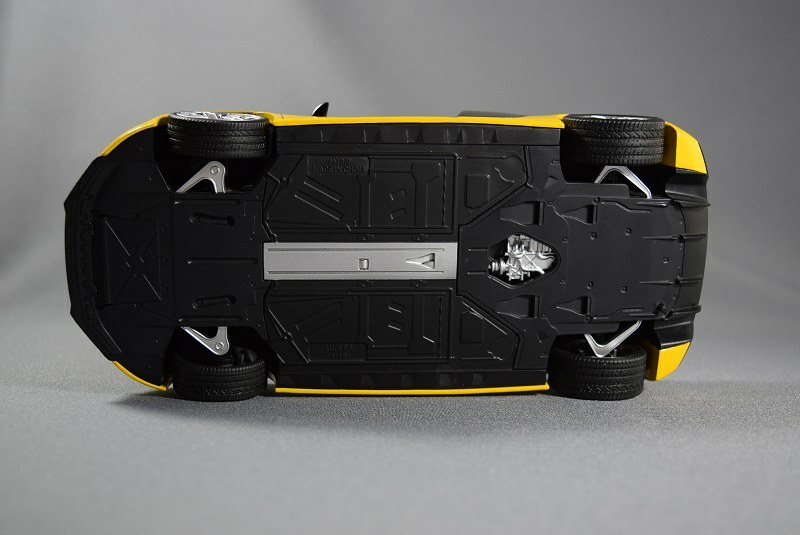 Also, the rear offset is wrong, wheels should be in more. 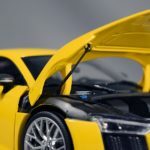 Obviously, in a perfect situation, the model should have been crafted with two different sizes for front and rear, iScale got lazy or put profit margin in front of execution. Overall, I’m giving them a failing grade. 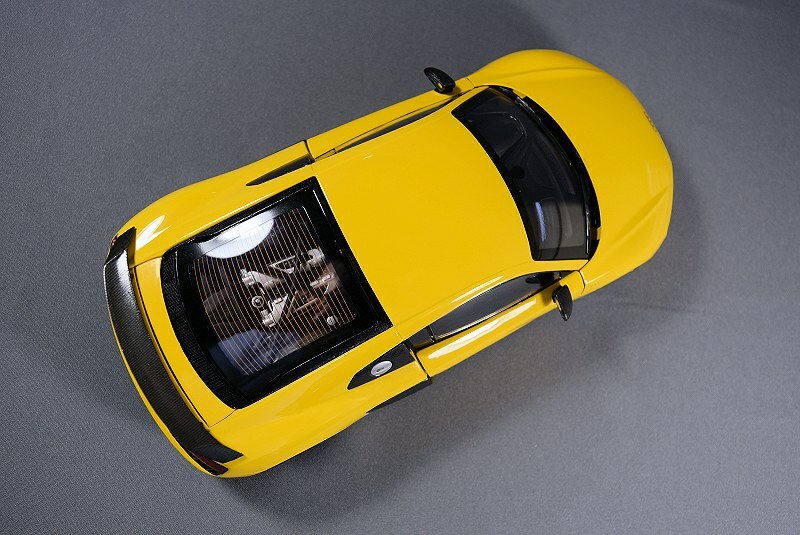 The interior is completed in all black, with the yellow exterior the package works well. We have full carpeting throughout and fabric seat-belts to boot. I actually like the execution of the interior. 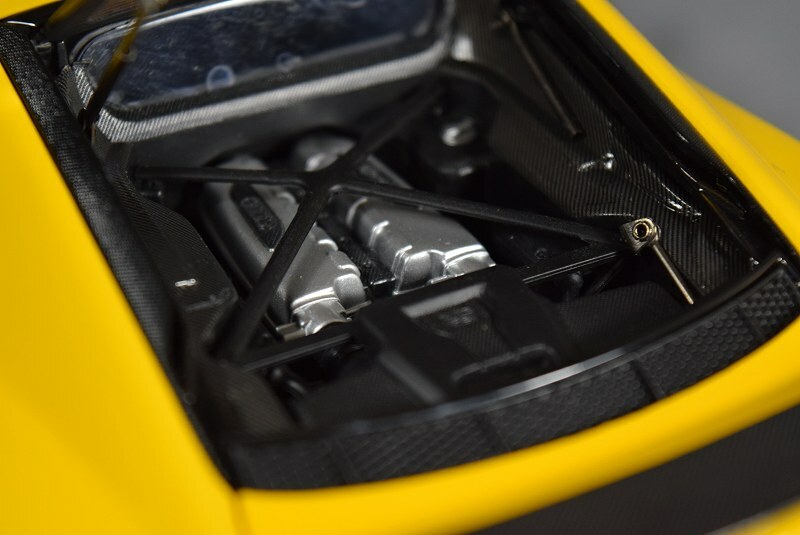 Materials are good, detailing on all the interior bits is done well and the accenting carbon fibre pieces are crafted with care. The big win over the first release is iScale did paint the upper window moulding black, looks much better eh! 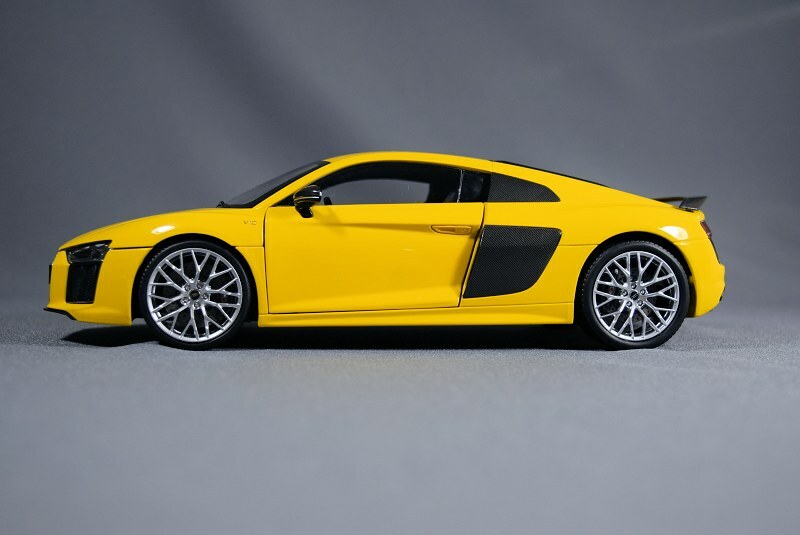 For an Audi fan like me the addition of the Audi R8 V10 Plus Coupe is a must. The overall execution here is average at best, there are many quality control issues that need to be addressed. 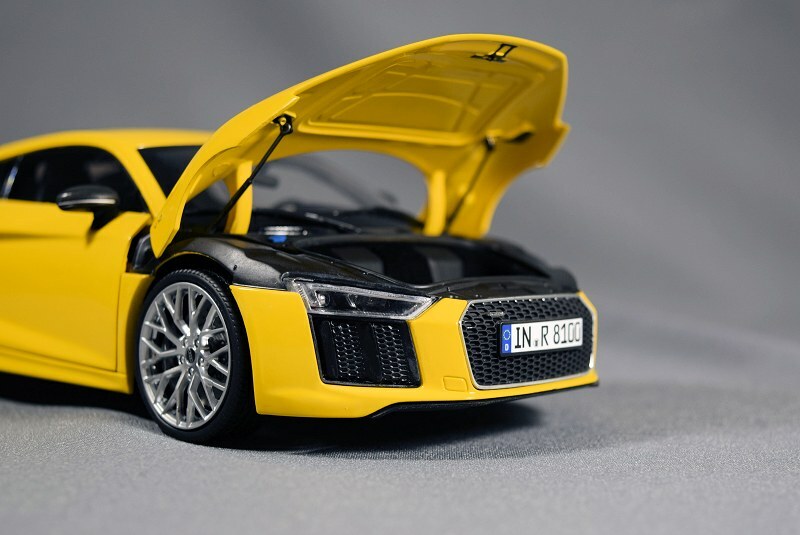 Audi AG definitely needs to find another supplier or implement stricter guidelines to their scale model assortment. Hey I’m willing to take the job! In all seriousness, this one is a pass unless you’re comfortable with putting her under the knife or want that missing piece in your supercar collection. Enjoy the pics! 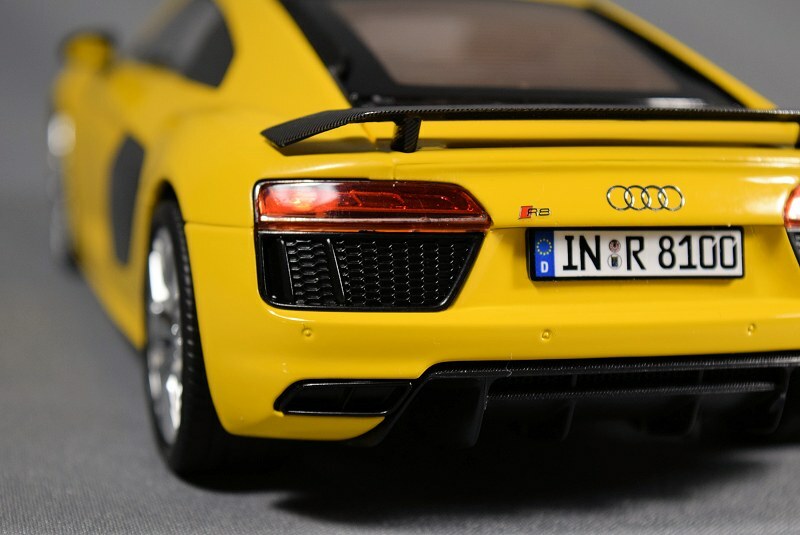 13 Responses to "REVIEW: iScale Audi R8 V10 Plus Coupe – Dealer Edition"
Thanks for reviewing the i-scale 1/18th Audi R8 V10 Plus. 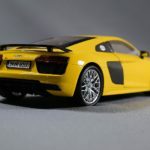 I’ve had a cautious eye on this particular model and also observed a drop in quality of this second generation scaled R8. 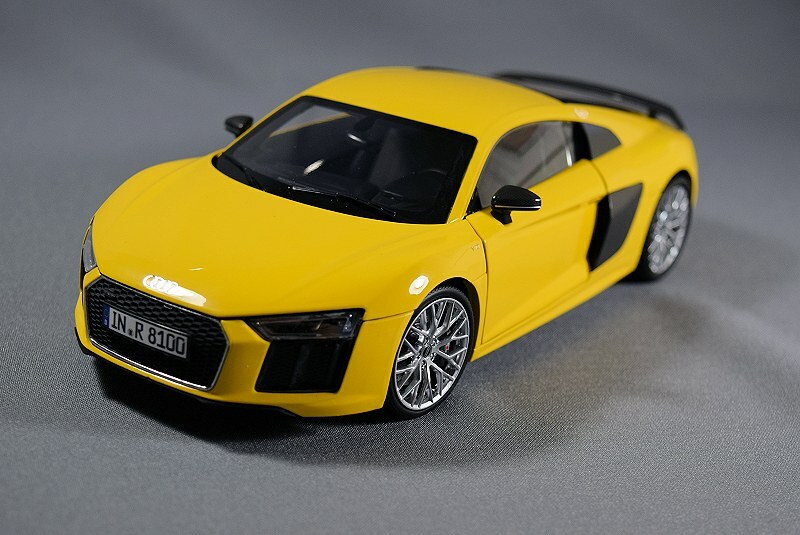 I’ve seen that Maisto has a license to release a range of new Audi R8 scale models, and of late their newer releases are looking very good with regards to overall stance, crisper mold details, and more use of authentic factory colors. So…….In a nut shell, with exception of the interior, it’s a Maisto! I can guarantee you the model is way, way, way ahead of Maisto in many ways exterior and interior. My model came with even paint tones and a near perfect stance. 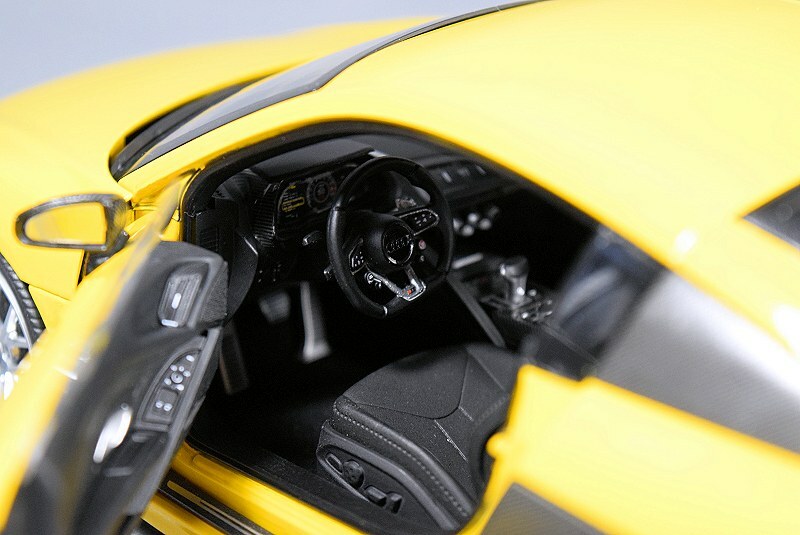 The interior is just as good as an AUTOart Performance Model. 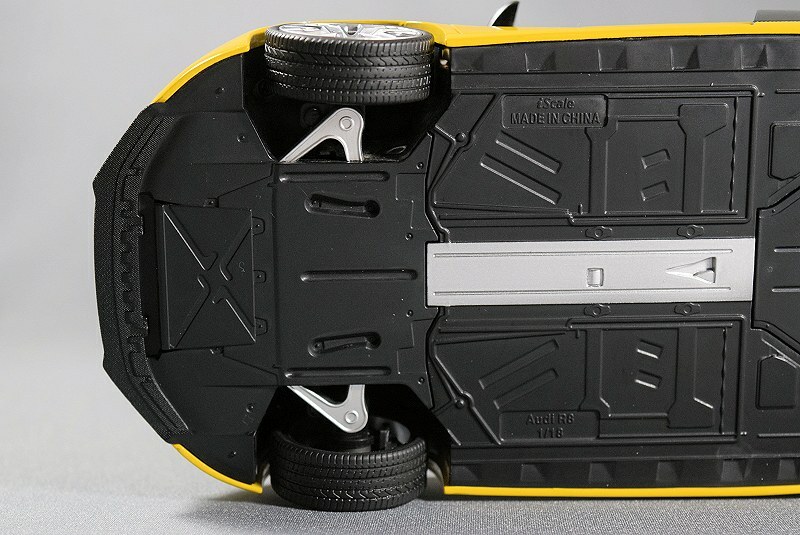 Like all Kyosho models, mine came with dogleg hinges for the boot but to my surprise, the model that I got had absolutely NO STRUTS in the boot!!!! Just those two giant sized doglegs, jagged, edgy and distastefully yellow. The left headlamp on my model was a little hazy, I don’t know why or how. I tried to polish it off with some silicone polish but it just wouldn’t shine. I can assure you, the model IS a good looking one and that could be justified by placing the Maisto alongside the Kyosho/iScale. 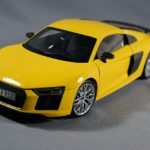 If there are any Indians out there looking to stay clear of the Maisto and getting the better Kyosho model, at Rupees Four Thousand Five Hundred (US$70.00) inclusive of import duties and shipping taxes I would recommend you guys start hunting on any Chinese Scale Model Online Store now. I have one, bought it from CK as soon as it was available. I have to agree with your assessment and include that the paint on the doors doesn’t exactly match the shade on the rest of the car, a big pet peeve of mine. 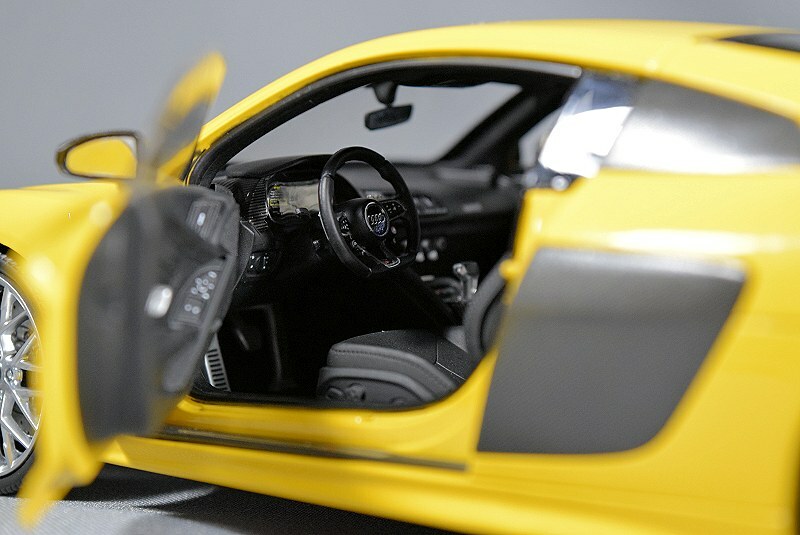 It’s a shame because a Vegas yellow R8 is my dream car!! 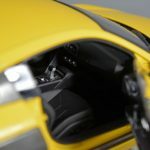 I don’t know what’s wrong with Kyosho lately, first is their Ousia sealed-body diecast, the next is their Samurai resin, and now this. Since I don’t collect Bentleys & Rolls-Royces from Kyosho, I have no idea how detail and intricate they are, but to me, the best most-recent piece from Kyosho is the Land Rover Defender, and I have one in green. 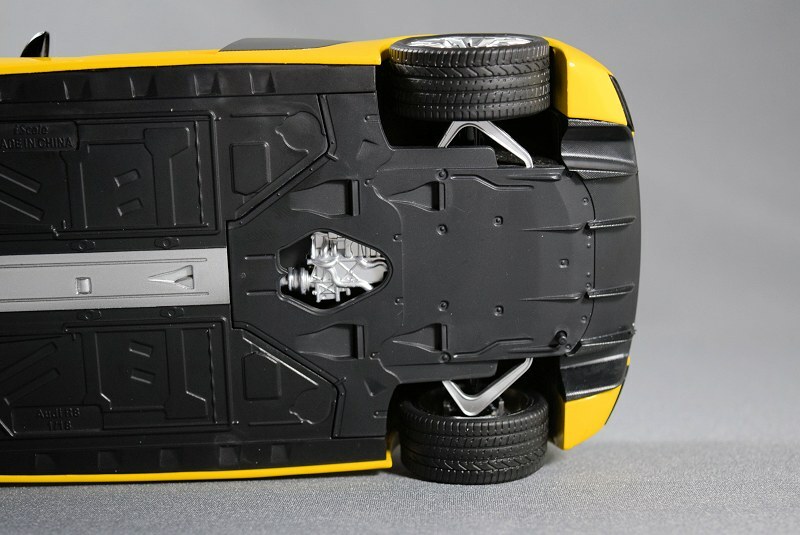 DIE-CAST (yes, it’s die-cast, not resin), full open, acceptable engine & undercarriage detail, working suspension, and good interior, combine with a very attractive price ($126 from where I bought it). I don’t know the price of the Rolls-Royce available at your location, but from where I am, a Kyosho Rolls-Royce Phantom EWB is around US$202. That’s a $76 difference from the Kyosho. 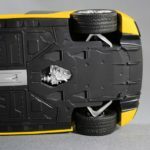 And you’re right: Even with a $202 price tag, the Rolls-Royce Phantom EWB is still using dogleg hinges on the front hood, contrary to the real-life vehicle’s use of intricate hinges. 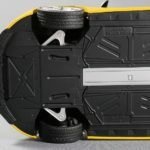 Once again, my Land Rover Defender is an excellent model on all fronts, and that includes the use of real hinges, not doglegs. 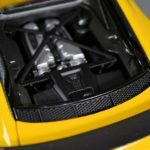 About the panel gaps: How does AUTOart managed to deliver excellent panel gaps & shut-lines on almost all of their models, even with the Koenigseggs’ unique door-opening mechanism, and with “lower end” Performance series, while Kyosho doesn’t? I hope it doesn’t sound too harsh, and by no mean insulting Kyosho, but I can’t understand their moves lately. I just hope they get back on track soon, and start producing models properly like they did around 5 years ago. 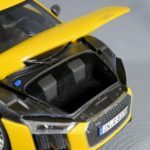 Well, I guess this can also be applied to Minichamps. 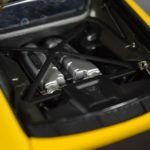 “$76 difference from the Kyosho”. Sorry, I mean the Defender. 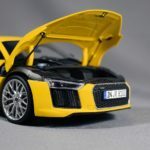 Living in India, acquisition of elite scale models is a daunting task. We have a very limited number of choices and sometimes we tend to have to pay too much. 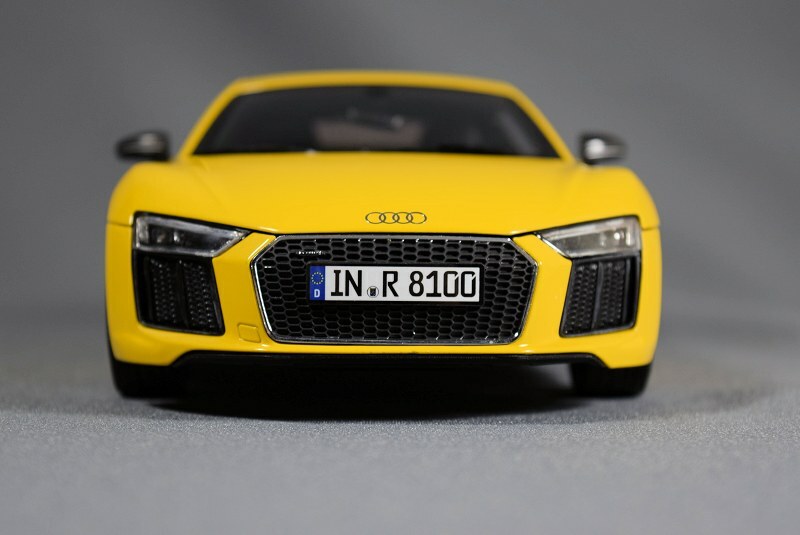 Apart from Maisto, I don’t think that there’s another manufacturer that currently sells the 2016 Audi R8 V10 Plus. 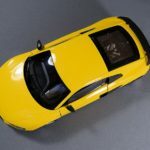 Having looked at all scale model sellers online I finally managed to import the EXACT, SAME model in Vegas Yellow, from China at the price of a Bburago Signature Edition Model, and I must admit, as much as I was excited to see the yellow brick sit there in those foam boxes, I was appalled at the overall execution of the model. It’s 1/18 & DIECAST !